1) Does this photo inspire you? Trouble you? Convict you? 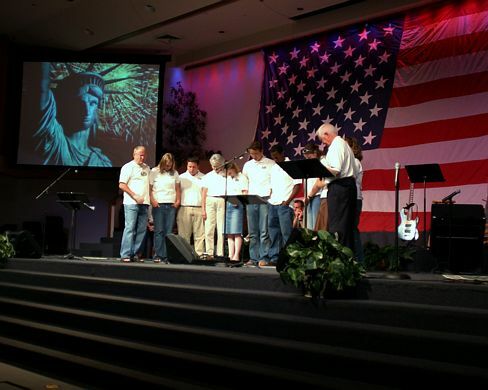 2) What role should patriotism play in our worship gatherings? Very timely, very troubling. Memorial Day weekend and Independence Day weekend are my two least favorite church services of the year because of the uncomfortable mixing of church and state, and pledging our allegiance to something/one other than God. Extremely troubling. It reminds me of pictures of Third Reich German churches with Swastikas adorning their walls and altars. Last time I checked, we Christians were supposed to worship God, not Caesar. I agree with Brian Baute. I am so glad my community of faith did not mix church and state. Last year one of our ladies drapped a flag around the cross and I almost threw up. I told our pastor that we should not be doing that. He agreed...we shall see if it happens again this year. If it does I will be pissed yeat again! I also have a negitive reaction to this picture. I am more interested to hear what a person outside the church thinks of this. I doubt they would even recognize it as a church worship service. Do other countries do this in thier churches? Yah, the picture really does make me convulse. I have nothing constructive to say accept that the line between Christianity and American Nationalism is so freaking blurred it's spooky. The flag was carried in procession yesterday at our church, in honor of the veterans of all wars, especially those who had given their lives for their country. It's a sort of tradition as we have a number of vets at our parish, but other than that and a nod to "America" as the processional hymn, the flag was returned to its corner of the sanctuary and the day proceded like almost every other sunday, just with different readings from the last. I see no problem with flags in church, but this picture disturbs me greatly. It's not an acknowledgement, it's a demand. It isn't a mention, it becomes a focal point. It isn't made secondary to the Eucharist, reading of the Bible or even the cross of Christ. It's made primary -- and, imvho, is therefore idolatrous. But some folks will never accept that. Lauren, here is a positive picture for you.... a group of high schoolers washing each others feet. I have done this with every youth group I have ever worked with. Or someone feeding the hungry. Or a group of people around a campfire with a guitar and Gods creation in the background. Frankly, I think the scales on your eyes are falling off, and you are seeing worship as what it is and not what our culture has made it. Interesting thoughts everyone. Lauren -- it does seem that many of the pics have been responded to negatively (this has surprized me a couple times). However, I'll try to include a couple more that strike at the beautiful and redeeming aspects of evangelical worship. Stay tuned!